This edition includes: (1) our quarterly update of the Global House Price Index; (2) a discussion of some of the factors associated with the cross-country variation in house prices in recent years; and (3) housing sector developments described in IMF country documents over the past quarter. 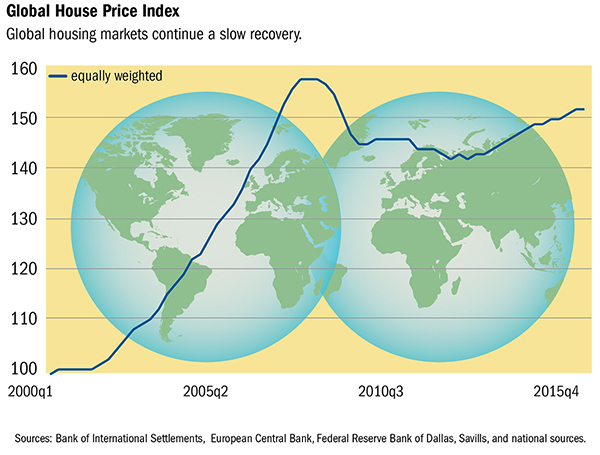 Our global house price index shows that, on average, prices are almost back up to where they were at the start of 2007 (Figure 1). There is a fair bit of cross-country variation, as shown in Figure 2. 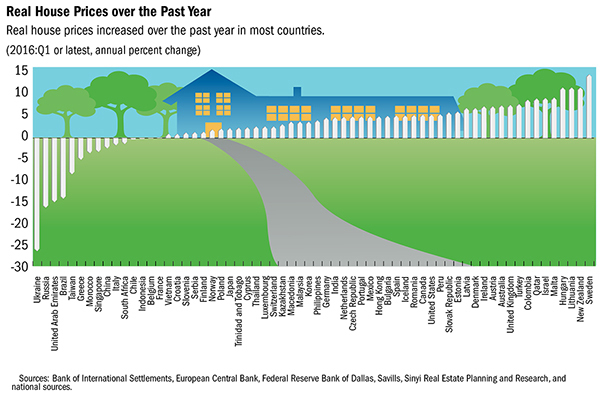 While house prices have increased over the past year in most countries in our sample, the pace of increase varies quite a bit. And there are still a dozen or so countries where house prices have fallen over the past year, including Brazil, China and Russia. Both real house prices and real GDP growth in the 2007-2015 period were well below the boom experienced during 2000-2006. In the earlier period, global real GDP grew by over 4% per year while real house prices surged by about 9% on average. In the more recent period, these grew by just 2% and 1% per year, respectively. The simple correlation between real growth in house prices and GDP growth was very similar in the two periods at about 0.6. Continue reading here.